Isn't it annoying when some kid suddenly rips through a crowd, lollipop in mouth and all, thanks to their "heelys?" For those who haven't yet been annoyed by them, this trendy piece of footwear looks like a regular shoe with a detachable wheel at the bottom near the heel. 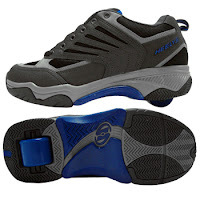 The shoes basically work as normal ones until the wearer shifts their weight to the heel, allowing them to roll foward. I'm surprised that more kids don't get hurt on these than already reported. I mean, it's pretty much like wearing rollerblades or skates, but without the rule that says you need to wear a helmet or padding when using them. And then I wondered, can people use these in races? Probably not. First, as this is a kids' thing, it would be hard to find the appropriate size. Second, if you were seen gliding through a course, you'd be DQ-ed or at least scorned by other runners in about a millisecond. Third, most courses have elevation changes that I'm sure would make some parts impossible to "heel" through (though you could, of course, run through them). The moral here is not to even think of these as viable for runners, though I'm sure the thought has surfaced in them for at least a second. Thank goodness measures are being taken to ban their use in certain areas. Yes, I think about these at about mile 20.